Lunchtime concert in The John Field Room NCH Friday 7th April 2017 with special guest John Elwes. Hugh Lane Gallery, Dublin 1, Sunday 6th September 2015 at 12pm. RHA Gallery Ely Place, Dublin 2 ‘Culture Night’ Friday 18th September 2015 at 19.30 pm. Nun’s Cross Church, Ashford, Co. Wicklow Saturday 21st November 2015 at 8pm. The nights lengthen and Alchemy Music Series presents its final concert of the 2015 Season featuring Alan Smale (violin) & and Ruby Ashley (oboe) respectively Leader Emeritus of the RTE National Symphony Orchestra, and former Principal Cor Anglais with the RTE National Symphony Orchestra and Principal Oboe with Irish Chamber Orchestra. 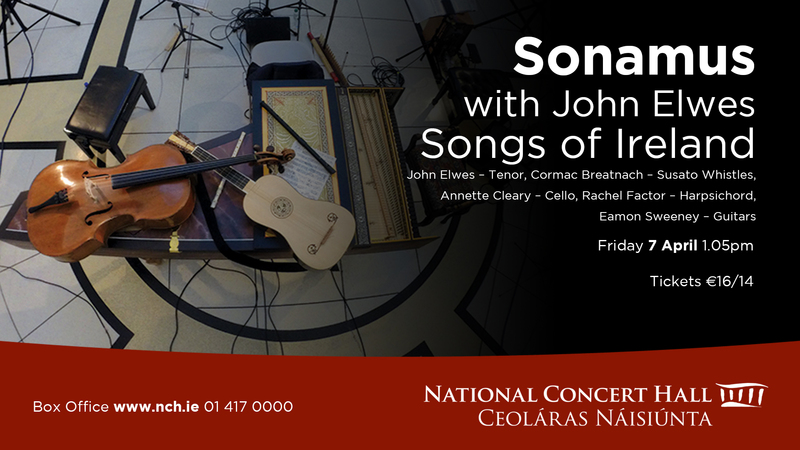 Alan and Ruby will join Sonamus, featuring Cormac Breatnach (whistles) Annette Cleary (cello), Rachel Factor (harpsichord) and Eamon Sweeney (guitars). The evening will feature a wonderful mix of music including – music from the movies The Mission & The Deerhunter, Traditional Irish music, Vivaldi’s Guitar Concerto, Turlough O’Carolan, and Handel. Taking place in the beautiful Nun’s Cross Church the atmospheric music will be enhanced by candlelight, discrete stage lighting, the subtle skill of esteemed sound engineer, Ben Rawlins…. and a nice cup of tea or coffee.